Once upon a time, there was the Open Office. Although designed to foster better collaboration, some work habits just didn't take well to the wide open and often distracting office floor plans that these workplace designs became known for. As these outdated layouts are phased out, the Flexible Office is taking its place, and UPLIFT Desk Acoustic Privacy Panels are here to offer a bit of reprieve from workspace distractions, starting with your desktop. Affordable all-in-one solutions that modify your workstation for better privacy, Acoustic Privacy Panels block sound, letting you focus on the task at hand and not the story about your office mate's weekend. Whatever desk setup you are at currently, Acoustic Privacy Panels can help you work better, and with fewer distractions. Made of dense Polyester fiber board that clamps onto surfaces up to 1.75 inches thick, more privacy comes by way of back and side panels that quickly and easily attach to almost any desktop, letting you create a productive sanctuary at your workstation. These are ideal desktop additions for nearly any desk, from our UPLIFT standing desks to your current desk. And the .85 Noise Rating Coefficient of the panels means that 85% of sound is absorbed, allowing only 15% to reflect back into the room. Acoustic Privacy Panels are available in your pick of back and side panels; back panels are installed at the rear of your desk, while side panels go on one or both sides, allowing you to create the ideal (and idea-facilitating!) workspace for you. How do Acoustic Privacy Panels block sound? UPLIFT Desk Acoustic Privacy Panels are constructed out of dense, high-quality fiber board that was designed to absorb and dampen noise from the environment. Installing them at your workstation allows you to block background noise so you can work with fewer interruptions, while also adding a little extra privacy to your desk. Why do I need Acoustic Privacy Panels at my desk? We recommend Acoustic Privacy Panels for anyone who works in an open office or "flexible office" floor plan, for students, for co-op workspaces, and pretty much any desk that would use a bit of a reprieve from unwelcome distractions. What is the deal with back and side panels? We designed Acoustic Privacy Panels to solve a very common problem - the need to block office distractions. The system works with back and side panels, which let you install the panels to the back and sides of your desk, respectively. How much noise can they buffer? Our Acoustic Privacy Panels have a .85 NRC value, or Noise Reduction Coefficient. This means that 85% of the sound waves entering into the material will be absorbed, while the remaining 15% will reflect back out of the material into the room. Yes, these will fit other standing desks and fixed-height desks up to 1.75" thick. Just measure your desk to see how wide you need your panel to be to fit your desk. Can I use the Acoustic Privacy Panel with a monitor arm? 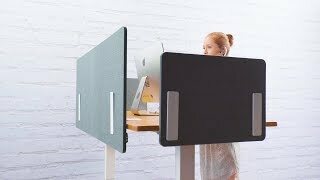 Most monitor arms can be used with these privacy panels. Many monitor mounts are flat on the back and will not interfere at all with installation of the panel. You can also mount the panels slightly further back, to accommodate mounts that protrude 3/4" or less. Is assembly and installation of the Acoustic Privacy Panels easy? You bet it is! To assemble and install the Acoustic Privacy Panels, just attach the included clamp brackets and support brackets to the panel with a few screws, and clamp onto the back of your desk. What do you mean by Acoustic "Privacy" Panels? Not only do our panels stop noise before they ruin your concentration, they allow you to build a work sanctuary, right at your desktop. What are side panels for? To dampen sounds from all angles! To create a focus fostering workspace, install a main unit on the back of your desk and a side panel to the left and right sides. We're proud to offer you three colors from which to choose: dark gray, light gray, and blue. Pick the panel that suits your style the best. Help! I can't find the mounting holes on my privacy panel! The holes may be hard to see because they're plugged. Look near the bottom side of the panel for four hexagon-shaped marks. These may be easier to see on one side of the panel, so if you don't see them on one side, check the other. Once you find them, simply pop the plug out with your finger and insert the mounting hardware. What's the purpose of these Acoustic Privacy Panels? Many modern office designs consist of more "open" floor plans, but not everyone works well that way. That's why we designed the Acoustic Privacy Panels by UPLIFT Desk. These cost-effective desk accessories help you work better with just a few easy additions. If you struggle to focus at your desk, if your office has a lot of background noise, if you just prefer more quiet at work, our Acoustic Privacy Panels are here for you. They're similar to the folders you used in elementary school during tests to block out distractions - except our panels block both sight and sound! Can I choose my hardware? Yes you can pick your Privacy Panel hardware from a trio of colors, chosen to match our desk frames: white, black, and gray. What are these panels made out of? Acoustic Privacy Panels are made from only the sturdiest, densest Polyester fiber board, 50% of which is made from recycled materials. Acoustic Privacy Panels are available in four sizes that can be mounted along the back of your workstation. The back privacy panel is compatible with 42 to 80 inch desktops. For a complete workstation partition solution, add a side panel to one or both sides of your UPLIFT desk. The side privacy panels are shorter than the back privacy panel to dampen noise without completely obstructing the view from your desk. Adding a barrier between desks doesn't have to be drab. Choose between blue, light gray, or dark gray for your Acoustic Privacy Panel. The polyester surface of the panel doubles as tack board for your notes or pictures. Black, gray, or white mounting hardware add a bit of contrast to the UPLIFT Desk Acoustic Privacy Panel. The mounting hardware will clamp on to desktops that are up to 1.75" thick. UPLIFT Desk Acoustic Privacy Panel clamp mounts are made to fit desks up to 1.75" in thickness. Hold up your Acoustic Privacy Panel in style with a black, white, or gray Desktop Acoustic Privacy Holder by UPLIFT Desk. Match the hardware to your UPLIFT Desk Frame and coordinating desk accessories or mix it up with a contrasting color. This holder allows for your Acoustic Privacy Panel to be easily repositioned on a flat work top as needed, to create a flexible, dynamic workspace. $79.00 List Price: $140.00* The list price is the same as the MSRP (Manufacturer's Suggested Retail Price). It may not necessarily be the price at which the product is sold.